This Dead Space 3 Bundle Isn't Just A Collector's Edition. It's The Dev Team Edition. Dev Team Edition? You don't often hear collector's items called as such, but when you take a look at what this bundle—by Visceral and Treehouse Brand Store—has to offer, you might see why. But what's more fun about this particular $100 set ($160 with the game) is that, much like the series itself, it's encoded with mystery. What does that entail exactly? Is it about Isaac? About the Necromorphs and the Markers? The Church of Unitology? What? What? Tell me already! Dead Space 3 Limited Edition: Includes the "First Contact" and "Witness the Truth" bundles. 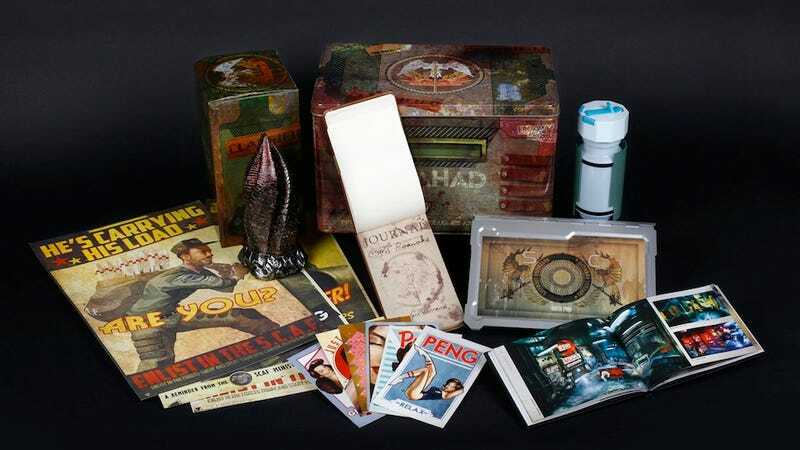 Tin Collector's Case: Measuring nearly 14"x9," this case is covered with mysteries and trivia from all three Dead Space games, debossed with full color art based on the designs from Ben Wanat (Creative Director for Dead Space 3) and Dino Ignacio (UI Designer for Dead Space 3). Serrano's Journal: Dr. Earl Serrano's journal full of clues and haunting artwork of his findings on Tau Volantis has come to life with exclusive content by Chuck Beaver (Story Producer on Dead Space 3). Art Book: A 4.75"x6.5" hardbound book containing 96 stunning full color pages, plus exclusive material from the Dead Space art department headed by Alex Muscat (Art Director for Dead Space 3). Flip Book "Data Pad:" A 10"x7" book with a metal cover that contains 9 image sets made with clear PET cover sheets over heavy-weight cardstock. The flip book was designed by Dino Ignacio to be a functional prop version of the Dead Space User Interface in the game. Marker Statue: A 8" hand-sculpted, custom-molded polyresin statue that's coated in metallic paints to replicate the maddening glyphs of the Black Marker. Med-Pack: The med-pack in the game has been recreated as a 14 oz. PET water bottle, perfect for carrying your beverage of choice. Poster Pack: A set of three 5"x10" single-sided posters replicating the nostalgic posters found throughout Dead Space 3 that depict an older age of space travel. Postcard Set: A set of six 3.75"x6" Peng themed postcards, double-sided with art on the front and Dead Space-branded postcard information on the back.